Owner Felicia Salazar at the young fashion and lifestyle boutique Fifi & Bella at 50 Greenwich Ave. in Greenwich. 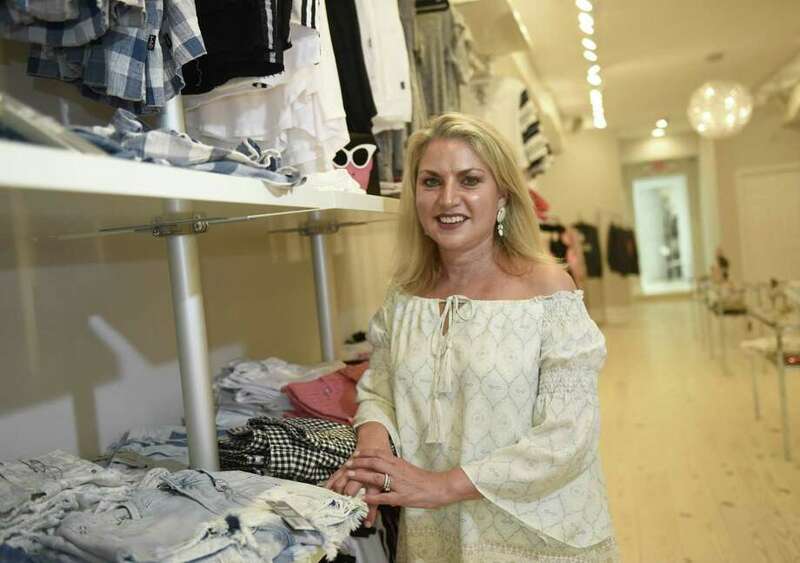 The owner of a new Greenwich Avenue retailer knows her business won’t succeed if she relies only on selling clothing. That’s why she chose the storefront at 50 Greenwich Ave.
“I liked the spot because it looks like a runway,” said Fifi & Bella founder Felicia Salazar, of Armonk, N.Y. Its proximity to The Granola Bar and Chipotle at the top of the avenue is another perk, she said. Fifi & Bella, which opened in late May, sells feminine clothing with sizes ranging for teenagers to young adults. Salazar, a mother of three girls, hopes to use her new brand to not only sell merchandise, but host workshops and fashion shows to help girls develop their personal style. Salazar plans to mix in etiquette courses. “I want this to be a place where girls feel confident. Girls of all shapes and sizes — I want everyone to find something for them,” Salazar said. The idea for Fifi & Bella originated last year as Salazar was searching for dresses for one of her daughters attending friends’ bat mitzvah celebrations. She met people in the tween and teen fashion industry and started buying pieces she could sell under her own brand. Previously, Salazar had worked in sales and marketing at brands including Revlon, she said. Salazar has also run a small accessories business. She now draws from those experiences in launching a retailer with brick-and-mortar shop. But the biggest inspiration for Fifi & Bella is her daughters — Angelica, Amanda and Ava — who customers will find often helping out at the store. On a recent afternoon, Salazar’s husband was working behind the counter while his wife and daughters were organizing and hanging merchandise. Greenwich Avenue’s new retailer held a soft opening just before Memorial Day weekend, due to customer demand, Salazar said. People walking down Greenwich Avenue so frequently knocked on the door while she was setting up the store that she decided to open early. Other things to come include a candy bar in an alcove located near the back of the store, where Salazar plans to put a small sitting area and, on the weekends, a mimosa bar for parents while their children shop. Salazar wants to create a fun environment that feels “girly, glam, light and airy,” she said. The store is arranged by age category, starting with eldest toward the front. Everything is hung on rolling racks so the store can be easily rearranged for events and fashion shows. Salazar hopes Fifi & Bella will fill what she sees as a “void” in teenager apparel shops in downtown Greenwich. Soon, she plans to work with a seamstress who will provide alterations and customizations for her customers. Fifi & Bella plans to host a grand opening toward the end of summer, right before school starts. For now, the shop is open every day, with slightly more limited hours on Sundays.